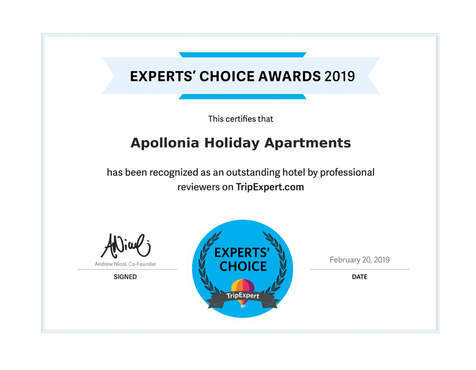 Apollonia Holiday Apartments is a 2018 Travellers’ Choice Award Winner! Travellers' Choice awards are the highest honour TripAdvisor can give – meaning Apollonia Holiday Apartments are truly exceptional. Based on reviews and opinions from millions of travellers, Apollonia is in the top 1% of hotels. 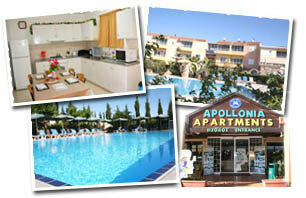 Self-catering family holiday apartments in Paphos, Cyprus. owned and run by the Constandinou family, who have over 25 years experience in tourism. 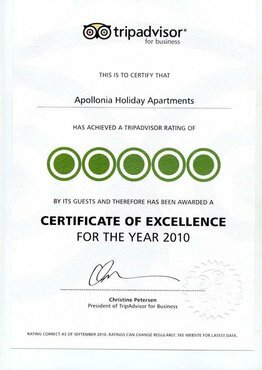 Guests of Apollonia are given the finest traditional Cypriot hospitality, with a friendly welcoming service and are always treated as friends and members of the extended family. Centrally located, all of our apartments are furnished and equipped to a very high standard because we understand that your holiday should be a special and unforgettable experience. Our family has earned a reputation for hospitality, care, and attention to detail, which is second to none. Our guests have the flexibility of choosing the holiday duration of their choice, personalizing their holiday requirements, whilst often saving on the cost. Enjoy the space, privacy, and facilities of this quality fully furnished and equipped apartments, where you can relax by the pool in quiet surroundings. Free Wi-Fi / wireless internet in all communal areas. Free use of internet station and printer at the pool bar, facsimile and copy service. Free early arrival or late departure service offered (subject to availability). Arrangements can be made for use of the pool on arrival. Free cot, buggy, highchair, children's DVDs (on request) and baby car seat for taxi transfer (on request). Free seasonal fruit, coffee, jelly or drinks, by the pool whilst you relax (every day). Free use of apartment safe. Satellite TV (BBC world, Euro News, Discovery Science, Discovery world, etc). Details of the following services are in the information pack in each apartment and can be booked through reception. Beauty Treatments and Hairdressing massage, manicure, pedicure, reflexology etc are available on request. A hairdresser will also visit on request. Excursions, safaris, mini cruises, diving, horse riding, rent a car etc. Baby Sitting Service by a British woman with enhanced CRB check. Flat 32" HD TV, radio/CD & DVD player, safe deposit box, hairdryer, alarm clock, air-conditioning, electric fan, kettle, toaster, juicer, electric oven/grill, hob and extractor fan, large fridge/freezer, microwave oven, citrus juicer, coffee maker (on request), double glazed windows, dishwashing fluids and cloths, complimentary bathroom toiletries, first aid box, plus many extras not normally available in holiday accommodation. Seven nights accommodation including car hire. 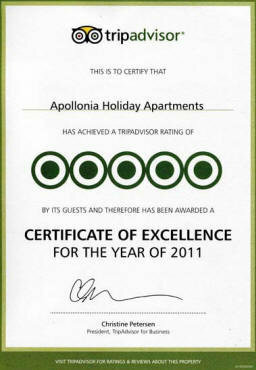 This year's awards are based on over 1.5 million expert reviews from leading travel guides, magazines and newspapers. 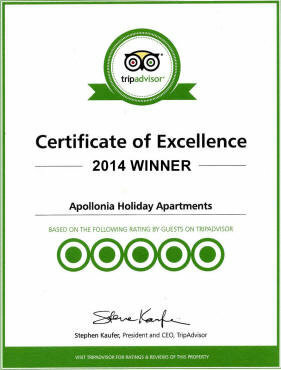 The award recognizes Apollonia Holiday Apartments as one of the best hotels in Paphos!